Why do I need to reconnect my Spreaker and YouTube accounts in order to have my YouTube plays counted in my statistics? I know that YouTube listens are now included in the overall plays of my statistics, but they aren't showing up in mine. How can I fix that? How do I get the most accurate stats for my podcast? How do I use ID3 tags? Our Listener Analytics section gives you an in-depth understanding of who your listeners are, where they're from, and how they consume your content. Get a time-based overview of the way people listen to your content: do fans tend to listen in while you're going live, or do they access your content on-demand? All this information is available in the Play Details tab. You can change the timeframe and get data for days, weeks, and months. Opt to get the big-picture of your show, or focus in on a single episode. Which episodes did your audience appreciate more? When did your content really resonate with your community? You can get an idea of this through the "likes" section. How popular is your account? The Followers section traces spikes in followers back to actual episodes and marketing decisions. What devices are your listeners using to tune in? Are they listening through Spreaker's website and mobile apps, Apple Podcasts, iHeartRadio, YouTube, or the embedded widget on your site? Which external directory is referring you the most plays? The "Sources" tab answers all of these questions. What devices your audience use the most? Do they listen from a Computer, a Tablet, or a Smartphone? The Devices section provides you with a complete overview of the Operative systems, Mobile devices, and Desktop ones. Where are your listeners tuning in from? Which country or city? Get the breakdown of your listener geographics with the Geolocation section. Geolocation information is available for all plays made through the website, as well as downloads. Benchmark your episodes’ lifespan and learn how specific promotional actions can improve the popularity of your episodes. This chart enables you to see your episodes’ cumulative plays and downloads over time, relative to their release date. This way you can measure if specific topics or marketing actions can increase your episode’s performance. Take your show to the next level by knowing the exact demographics (gender and age group) of your listeners. You can use this information to better target your message, or offer it to prospective advertisers. This information is only available for plays made through Spreaker (not downloads), and is derived from users who have signed up to the service. If your demographic numbers seem low, it's because Spreaker draws this information only from listeners who have signed in and listen to Spreaker. The numbers come from the information they've provided in their profiles (or their Facebook profile, if that's how they registered). These numbers aren't necessarily linked to each other. 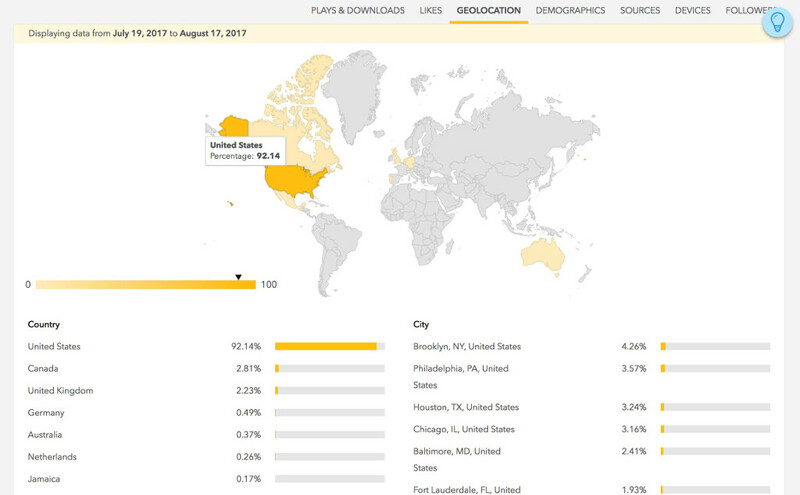 For example: you could have 10 listeners in New York, but 100 listeners total in all of the United States. You can also have 20 listeners in Rome, but 60 listeners total in Italy. In this case your more popular city is Rome, but more popular country is the United States. In order to update your statistics with your YouTube listens, you must re-enable authorization between your Spreaker and YouTube accounts. You can do this by simply disconnecting and then reconnecting the two in your Settings, under Connected Accounts. Re-enter your password at the prompt. Once you've done that, updating your stats may take a few hours. Preloading is a technique where an audio player automatically starts downloading the audio content (or a chunk of it) without any user interaction. When a podcast is listened to on a Spreaker property (our website, the embeddable player, our mobile apps) the media is not automatically preloaded, in accordance with the IAB specifications. In case you’re going to create your own customized player for a podcast hosted on Spreaker, you must avoid preloading to ensure compliance and metrics accuracy for your podcast. This will also reduce unnecessary bandwidth usage. For a web-based audio player, you should use the preload=”none” attribute of the html5 audio tag. Autoplay is when media starts playing automatically when the page loads. This is often perceived as a bad user experience; mostly because the user is not expecting to hear audio when they did not select that action, such as pressing the play button. When a podcast is listened to on a Spreaker property (our website, the embeddable player, our mobile apps) the audio never start playing automatically, in accordance with the IAB specifications. In case you’re going to create your own customized player for a podcast hosted on Spreaker, you must avoid autoplay to ensure compliance and metrics accuracy for your podcast. This will reduce unnecessary bandwidth usage and provide a better user experience. For a web-based audio player, you must not use the autoplay attribute of the html5 audio tag. ID3 tags are metadata stored within MP3 files that contains information such as; the title of the podcast or episode, the artist, and an image artwork for the episode. There are two versions of the ID3 tags. ID3v1 contains only basic, text-only, information and it’s placed at the end of the audio file. ID3v2 consists of rich type information like the artwork and they’re placed at the beginning of an audio file. By using ID3v2, a podcast player can display such metadata without having to download the entire file.